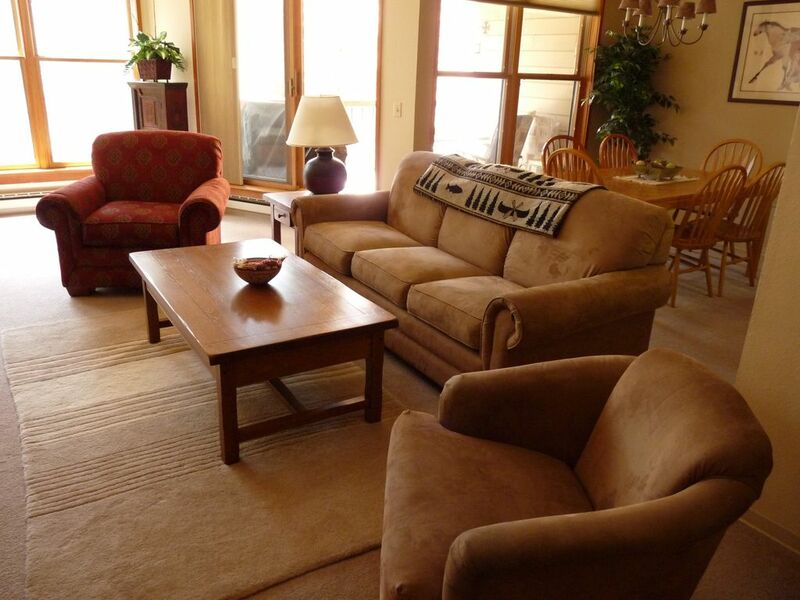 This condo is perfect for the family or a group of adults and has loads of room to spread out. With over 1,250sf of space, a great layout and tall ceilings you wont feel cramped in this tastefully decorated home. There are many extras such as books, DVDs,CDs, videos, games and water toys for the large indoor pool. You'll be surrounded by pines and aspens and know you're in the mountains. As owners, we spend lots of time at the condo ourselves and it's set up with everything you'll need for a great vacation. Catch the mountain air on the private balcony or unwind by the no-fuss gas log fireplace. Save on parking and take the efficient and free shuttle service to the slopes, only a few minutes away. Our totally remodelled kitchen has all new cabinets, GE and Whirlpool appliances and granite tile countertops. It is fully equipped for the culinary-minded. The complex features a wonderful clubhouse with large indoor pool, sauna & jacuzzi. This is truly a home away from home that, like our regular guests, you'll want to come back to. Sleeping setup: one king, two twins, a queen sleeper and a full-sized day bed. We work hard at keeping the condo in top condition and comfortable – sorry, but no pets or smoking. We live in the town due south of Denver and purchased the condo in 2002. We have been renting it out since that winter and have established many wonderful relationships with our returning guests. We love coming up to Keystone in the winter but find the summer even more fun. There are art fairs, concerts and just about any outdoor activity you can think of. Our two boys grew up skiing the slopes of Keystone, bike riding the roads of Summit County and kayaking Dillon Lake. A great place to visit all year long. We chose this property because it affords us a place to get away from the city but not compromise comfort. With 1250 sq. feet of space it is large enough for the family to spread out and relax but it has a cozy and very comfortable feel. The kitchen has it all and we even have sleds for the kids and games, books, dvd's, and cd's for everyone to enjoy. A true Home Away From Home!!! The condo has very high ceilings, lots of windows and natural light, so it never feels cramped like many of the newer condos in the area. The furniture is new and the kitchen remodeled so you can be assured it will feel like 'home'. We drive our cleaner crazy by keeping loads of little extras that make for a happier stay - things like books, DVDs, games, spices and even plastic wrap in the kitchen. Separate controls for each bedroom and the living areas. Toys for the pool and sleds. A great assortment of videos, DVDs and CDs are available in the condo. Lots of choices for both adults and children! Beautiful, large indoor pool with hot tub and sauna. Private indoor ski locker, Cable TV (3 new HD flat-screens), DVD (2), Fully equipped kitchen has every cooking utensil you could look for, great assortment of games, DVDs, CDs and videos for children and adults. Clubhouse has sauna, hot tub and very large year-round indoor heated pool. WiFi too!!! We enjoyed our stay very much. The condo is very close to the mountain and skiing. We skied 2 full days and one night at Keystone and one full day at Breckenridge. Breckenridge is an easy drive (probably 20 minutes tops) from this condo. We made 3 trips over there to ski and to eat. Also, the town of Dillon is very close as well. Great food, nice grocery store and outlet mall all found in Dillon. My only major complaint about the condo would be that there is no washer/dryer in the unit. We overlooked that somehow. When we started our week, we only had one washcloth each and one towel each, maybe a couple of more towels. My point is, nobody wants to walk somewhere and do laundry especially when there is a ton of snow on the ground everywhere and the walkways were very treacherous. We did not want to try to carry our laundry somewhere to do it. Also the sink in the kids bathroom did not ever drain after the first use. The bed in the master bedroom is also pretty hard. However, I do think the good outweigh the bad here. The condo was very clean. The location is awesome. The kitchen is very nice. The living room is cozy and comfortable. The owner is very nice and easy to work with. Overall, we had a great stay! Thanks for the feedback. I'm glad you enjoyed your time up in Keystone. I wish you had contacted me and let me know the drain was a problem because I would have taken care of it immediately. Luckily, the bathroom has two sinks so hopefully the kids shared. As for the towels, the cleaners always leave 4 bath towels, 4 hand towels and 4 washcloths. Usually that is sufficient for a group of 4.
clean and safe property! would recommend this property for anyone staying in the keystone area. our experience at the property was great! owners were great to work with throughout the renting process! the condo had everything we needed in the kitchen for cooking and so much more. the sleeping arrangements worked great for our group as well! We were thrilled with our stay. Gary was really easy to work with and the condo was very nice. Great stay for our family ski trip. Very convenient location for Keystone and A Basin skiing. The condo was comfortable and worked well for my family of five. Gary was very responsive and available to answer questions. The rental went smoothly and we will definitely consider a return for future trips to Keystone. This condo was clean and well-maintained. The kitchen had all the necessary amenities. The property owner was incredibly accessible and very helpful. Renting this property was easily my best VRBO experience. Everything my family needed for great few days skying. Condo is very comfortable. Great location and owner is very kind. My kids had a blast! Thank you.